16th and 'K' St. N.W. 3) Use a 4" round cooking cutter and cut out 24 circles. sheet and sprinkle gently with sugar. place another baking sheet on it. 1) Add Coco Lopez to whipping cream to taste. 1) Bring the first four ingredients to a boil. 2) Top with a phyllo round. 3) Top phyllo round with diced mangoes. 4) Place a phyllo round on top of the mango. 5) Top with coconut whipped cream. 6) Finish with another phyllo round. 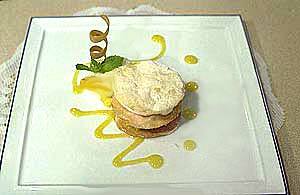 7) Decorate plate with mango puree. 8) Place a scoop of lime sorbet on the plate. 9) Garnish with a sprig of mint. 2) Put on cookie sheet. 4) Remove and set aside. 6) Place in a sauce pan and bring to a boil. yolks and vanilla until incorporated. the egg mixture to temper. mixture and mix until smooth. 10) Strain and put in a water bath to cool. Set aside. 13) Set aside for 30 minutes to absorb. 15) Cover with aluminum foil. 17) Remove from oven and set aside to cool. 18) Place sugar, orange juice and zest in a pot. to melt. Remove from heat. 20) Add the berries. Toss to coat. Add Gran Marnier. Toss again and set aside. 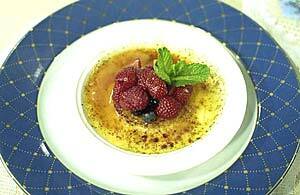 21) Sprinkle top of brulee with granulated sugar, lightly. 1) Bring all ingredients except pineapple to a boil. 2) Add the pineapple and bring back to a boil. 4) Cool, remove pineapple and strain liquid. 5) Dice pineapple into 1/4 inch cubes. 1) Bring cream, milk and 1/4 cup sugar to a boil. mixture into the egg yolks and sugar while whisking. 6) Cool in an ice bath. cheesecake and glaze with a blow torch. 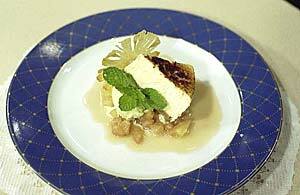 4) Scoop a quenelle of basil ice cream onto pineapple. 5) Lean glazed cheesecake against ice cream scoop.